Use Goverlan Reach RC to connect to any terminal server based connection. This includes RDP, RDS or Citrix XenApp session. Shadowing allows you to share the same session as the user, see what the user sees, and assist with applications or session specific issues. To shadow sessions with Goverlan, the Goverlan Client must be installed on any server that hosts logon session. For RDS environments, this will be the Remote Desktop Session Host (RDSH) servers. In XenApp environments, this will be the Presentation servers. For more information about The Goverlan Client, see Installing The Goverlan Client. Select the session to shadow by clicking on it. If virtual desktop sessions are distributed via a farm of servers, and the server hosting a user session is not known, you can query the user’s RDS session via the user name using Goverlan fastConnect technology. Goverlan fastConnect can tell you where any user is logged in. This will include any RDSH server or Presentation server that has the Goverlan Client installed. For more information about fastConnect, see Workstation Detection with fastConnect. 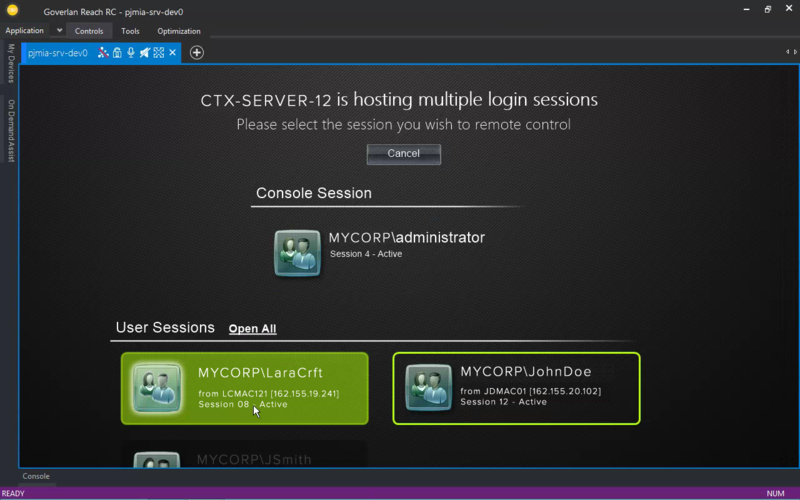 Click the User session information link to return to the main user session selection screen for that server and select another user session.